Thanksgiving always has a way of sneaking up on me every year. I mean, I could say that about pretty much every holiday, but Thanksgiving is my FAVORITE. It makes zero sense. I should be Pinterest-ing recipes and tablescapes months in advance. WHY AM I NEVER PREPARED? I’ve got my go-to dishes that I always make (boozy cranberry sauce, anyone?! ), but for some reason I’m always scrambling at the last minute to figure out what to drink. I know, I know, even I struggle with this dilemna. Because this is NOT the time for crazy bespoke craft cocktails for all of your guests throughout the night. That’s why large format drinks and punches are a perfect idea for the most epic meal of the year. Since you know it’s going to be an indulgent afternoon and evening of supping, why not make something that has a little good stuff sneaked in?! Like the antioxidant powerhouse that is Argentine Yerba Mate! Along with a multitude of vitamins like B and C and zinc and potassium, it also has that zip of caffeine similar to a cup of coffee that will surely counteract whatever food sleepies creep in by the end of the meal. Did I mention that Argentine Yerba Mate is also a yummy addition to cocktails? Oh yeah, I have! Many times! Haha. I feel like a broken record, but it’s all true, guys. I’m a fan. It can add tannins, a touch of smoke, and a slight earthiness to a drink. 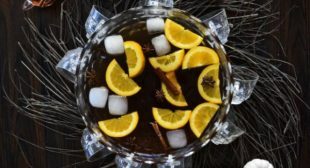 And when paired in this winter punch with mulling spices, ginger beer, and dark rum, you may just want to make a gigantic batch of this, hole up for the winter and sip your way to spring! I may not be as prepared for Thanksgiving as I’d like, but I DO know what I’ll be making an enormous punch bowl of in a few weeks – this Argentine Yerba Mate Winter Punch. Take that, Turkey Day! Immediately before serving, add ginger beer and ice cubes. Garnish with sliced orange wheels, cinnamon sticks and star anise. In a large saucepan, make a syrup by boiling 1 cup of water, 1 cup sugar and mulling spices for 10 minutes. Cool. Save extra for later. The post Give Your Thanksgiving a Winter Punch! appeared first on Bit By a Fox.